When you flip through a photo album, typically you get a glimpse into the "important" moments from the past. The moment two lives become one through marriage. The birth of their child. The magic of a first birthday. The first day of school. Sure, you may also see images of random days here and there, like a trip to the zoo or a family vacation, but for the most part these pages are reserved for the stuff that is deemed "special", a limited number of landmark moments that feel worthy of remembrance while hundreds of days each year simply came and went. Boyhood covers a few of these type of moments, those that would find their way into a photo album, like a birthday and a graduation, but for the most part it is a film that is meant to fill in the blanks, the empty spaces between each photograph that never seem to garner the attention they deserve. It's a picture that is profoundly powerful in its simplicity, one that deserves recognition for every scene that feels inconsequential because those moments are precisely why the movie feels so damn real. Truthfully, no scene should feel inconsequential because nothing about life is. I know some claim that the only reason Boyhood is such a beloved film is because of the 12 year "gimmick", the fact that it was made over such a long span of time and thus is admired for its ambitions rather than it actual achievements, but this concept is baffling to me. Such a thought is totally irrelevant because without the 12 year shooting schedule, the film Boyhood doesn't exist. Sure, Richard Linklater could have made this picture over a normal shooting schedule and simply cast different aged actors to play the role of Mason Jr., but then the authentic beauty of the narrative doesn't translate. So, yeah, this will probably win Best Picture because of the fact that it was made over the course of 12 years, but that is no gimmick. That IS the reason Boyhood is such an achievement. This unique cinematic vision resulted in one of the most fluid, gorgeous, and real movie experiences I have ever had the pleasure of witnessing. This was not my first viewing of Boyhood nor is it my first gushing, glowing review, but a Blu-ray revisit demanded another write up from me because the impact this film has on me is profound. As my wife and I enjoyed the perfect pacing, seamless editing and fresh and exciting approach to storytelling today on our couch, the type of lazy Sunday afternoon I day dream about when life gets hectic or times get tough, my seven year old daughter walked in and out of the room, and it is impossible not to connect to this Linklater work when you see her adorable face and wonder where the time has gone. She may be only seven, but at the same time she is already seven. One day a child is born, and when you blink your eyes they are in first grade, reading books and giving you attitude and complaining about dinner and not listening to a word you say...and it's totally amazing. I think the best thing about Boyhood, which is easily one of the greatest films of recent memory if not ever, is when you consider the idea of how it will age along with us. Right now, at the age of thirty with a child who is seven, I connect to the concept of the passage of time being relentless on a meaningful, emotional level, but what will it be like ten years from now? I will be forty, and my daughter will be seventeen years old, embarrassed of how I act around her friends, keeping me up at night when I worry of why she has missed curfew, and preparing to leave our home for college. If Boyhood is this amazing now, I can't even imagine the tears I will shed in the future as Mason drives away, down that beautiful open road with the song "Hero" playing, perfectly suited for the moment. 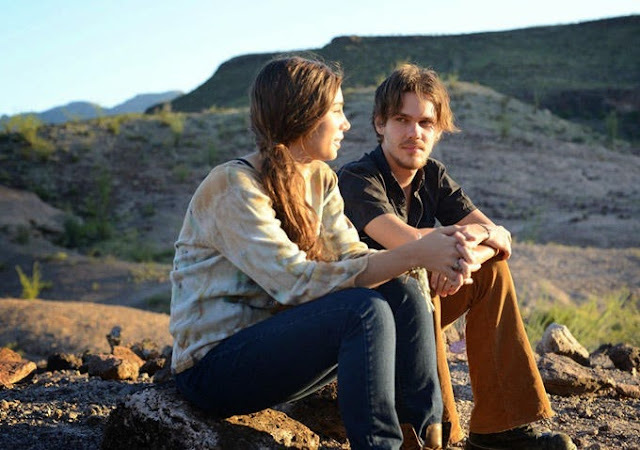 Boyhood isn't just a gimmick or just a well executed interesting premise. Boyhood is perfect.